Do you have a much loved home movie sitting in the back of your closet? Something you would love to screen but don’t have the means to project anymore? Then Home Movie Day is for you. 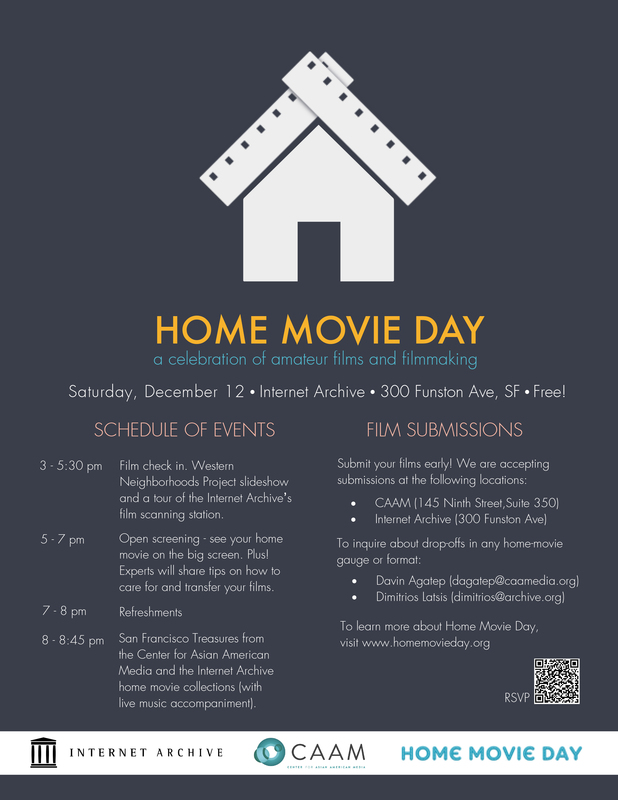 The Internet Archive will be hosting Home Movie Day for the San Francisco Bay Area on Saturday, December 12, 2015 starting at 3 p.m. The event if free and open to the public. Reserve your free tickets here. Home Movie Day provides an opportunity for individuals and families to see and share their own home movies with an audience from their own community, and to see their neighbors’ in turn. It’s a chance to discover why these films are important and learn how best to care for them. We will have the film projectors, you are encouraged to bring your own home movies on 8mm, 16mm, or Super 8 to project on our big screen. From 3:00-5:30 p.m. come enjoy free food and drinks, learn how the Internet Archive digitizes thousands of educational films, and participate in presentations on local history by the Western Neighborhoods Project. From 5-7 p.m. there will be the Open Screening of your home movies. 8-8:45 p.m. Stay to enjoy some of the Bay Area’s best home movies curated by the Center for Asian American Media (CAAM) and the Internet Archive with live organ music accompanying the (mostly) silent films. We are still accepting early submissions of your home movies for screening, both at the Internet Archive (300 Funston Avenue, SF) and at the Center for Asian American Media (145 Ninth Street, Suite 350, SF). Home Movie Day is organized by Pamela Vadakan (California Audio Visual Preservation Project), Antonella Bonfanti (Canyon Cinema/Center for Home Movies), CAAM and the Internet Archive.